Form to Database and Mail is an extension for Adobe Dreamweaver that allows to automatically save all the fields in a form as a table in a MySQL database. At the same time, it includes a copy of the same data in an email message - this way you are notified that a form has been filled in by a user. All you need is the database access information (mysql_host, database name, mysql_username and mysql_password); the table, as well as all table fields, are created automatically in real time. The table fields' names are created with the same names as the form fields, so that they coincide. Having the data saved in a database facilitates further processing, creation of reports or exporting of data into other applications, while also avoiding data loss by lost emails, spam filters, and other unsafe aspects of sending information by email. If your form includes File Upload, these files will be saved in a folder on the server and a reference to these files will be included; a copy will be also sent by email as attachment. In addition to the form data, for your convenience, the following info will be included as well: country and IP address where the form was filled in; URL of the form; server time when the form was submitted; as well as browser and OS details. This information may help you identify possible fraud in received messages and may help you offer a personalized response to your users or clients. To facilitate the revision of the data saved in the database, we included in this extension some PHP pages that allow to view all data online. To use this tool, you don't need to go through any additional setups, it is all confugured automatically. The server must support PHP scripts. Writing permissions on the folder "HDWFormToDatabase/saved_forms". 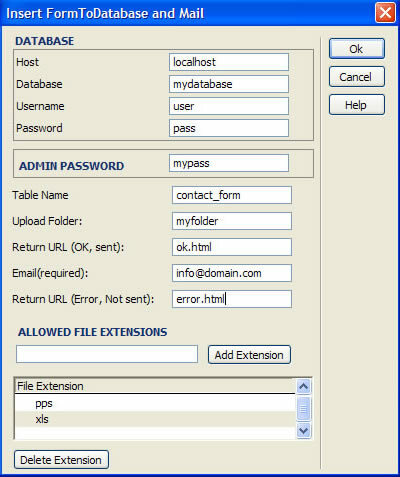 Note: Files, as well as the information pertaining to the extension's basic setup, necessary for its correct functioning, will be saved in the folder "HDWFormToDatabase/saved_forms". Additional Note: Most hosting services limit upload size to between 2 and 4 Mb. While technically Form to Database does not have any upload limitations, it will nevertheless comply with the limits imposed by the hosting providers, - their limits are technically impossible to ignore. Note: Max upload size is 2Mb. Click here to see a demo of the Form2Database browser (facilitate the revision of the data saved in the database). Further below you will find details on how to apply it in your forms. You may also check out this animated tutorial. You can find more about in our Form to Database - FAQ. The first step is the installation in Dreamweaver. To install the extension in Dreamweaver, simply doubleclick the downloaded .MXP file and remember to restart Dreamweaver once you completed this step. Now the extension will be available in Dreamweaver >> Menu >> Commands >> Insert FormToDatabase. To apply Form to Database and Mail to your forms, first open the page that contains the desired form (make sure the page is saved within the site!) and click anywhere within the form to select it. Host: it is the name or IP server where MySql is located. In most cases, this value will be "localhost". Database: the name of the database where the forms will be saved. Username: the username to access the database. Password: the password to access the database. this is the password that will be asked when accessing the additional tool that allows to view the contents of the table containing saved forms. Table Name: the name of the table where the form will be saved. You don't need to create this table in the database, it is sufficient to put the name here and it will be created automatically when you receive your first submitted form. Upload Folder: the name of the folder where the files, uploaded via the form, will be saved. This folder will be located in "HDWFormToDatabase/saved_forms" and 5 additional characters will be added to its name automatically, for added security. Return URL (ok, sent): indicate here the URL of the page where the user will proceed after submitting the form successfully. Usually it is a confirmation page where you thank the user for having submitted the form. Note that you must create this page first. Return URL (Error, not sent): in this case, this is the page where user will proceed when the form has not been sent through for some reason. Email (required): enter here the email address where the notification will be sent about submitted forms, including relevant information. Allowed file extensions: for your security, you can choose the kind of files you wish to accept, for example: doc, .pdf, .jpg, etc. Important! After this step Form to Database will already be installed in your form but you must remember to set writing permissions on the folder "HDWFormToDatabase/saved_forms" on your server, to ensure correct functioning of the extension. To access this tool, use the address http://your-web-site/HDWFormToDatabase/admin (replace "your-web-site" by your own website address!). Upon accessing this address, you will be asked for your admin password to be able to continue. In the next page you will have to choose which of the tables you wish to view (each table corresponds to a form), to finally access the list of the data sent in by the form.